New IP-100 owners will need to provide the serial number and MAC address of the IP-100. These numbers are located on the underside of the device. You can register prior to connecting or powering up the IP-100. 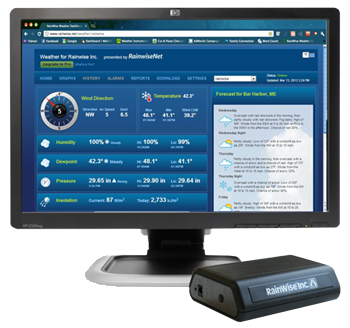 RainwiseNet, the online dashboard for RainWise weather stations equipped with an IP-100 Network Interface, uploading real time data and displaying it from any web browser. The RainwiseNet BASIC subscription comes free with your purchase of the IP-100 network interface. Once you register your station the basic package provides real time access to your weather data, up to 2 years of on-demand data archiving, and the ability to export your data in an excel spreadsheet format. You also can access RainwiseNET through a separately acquired Apple or Android app for your mobile devices. We have a weather station located at the Rainwise factory in Trenton Maine. To view all of the Pro features login at the top of the page with the user name "demo" and a password of "demo". You will have access to all of the demo pages including the settings page. Saving changes and uploading photos have been disabled. Our most popular package includes the RainwiseMK-III-LR weather station along with an IP-100 network interface. The IP-100 is a stand alone interface that simply plugs into your router. The IP-100 receives data wirelessly from the MK-III weather station and sends it on to the RainwiseNet cloud. No computer is required. Monitor your weather with your data on a PC, Mac, tablet or smart phone.